The Battle of Baltimore and the Bombardment of Fort McHenry was a turning point in the War of 1812. As the country celebrates the bicentennial of the war Baltimore threw a Sailabration with tall ships, naval vessels, an air show by the Blue Angels, and festivities galore. The ships began to arrive on Wednesday June 13th. Past met present as 1812 living history reenactors gave tours of important sites in the Battle of Baltimore (like the battles of North Point and Hampstead Hill) while the 2012 Navy parachutist team, the “Leap Frogs,” put on shows at Clifton Park and Patterson Park. Thursday was Flag Day, and as any good Baltimorean knows, the US Flag that flew over Fort McHenry during the bombardment was not made by Betsy Ross, but was sewn by local widow Mary Pickersgill. 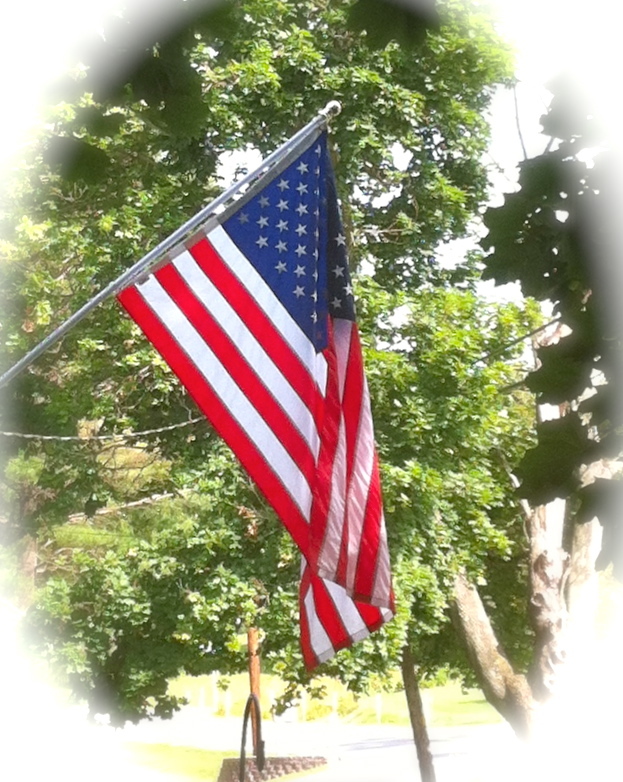 When Francis Scott Key penned the Star Spangled Banner it was Pickersgill’s flag he saw waving at dawn’s early light. During a special Flag Day ceremony at the Flag House three strands from the original Star-Spangled Banner were sewn into the National 9/11 flag. Later that day the 33rd Annual Pause for the Pledge took place at Fort McHenry. Looking at some of the smaller ships at the the marina near Rash Field. The Baltimore Aquarium is the background. 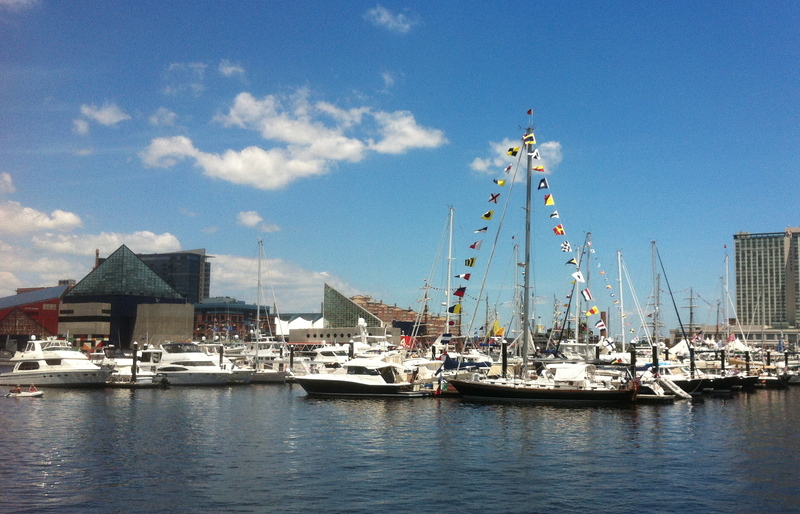 Free tours began on the ships at the Inner Harbor, Fells Point and Locust Point. 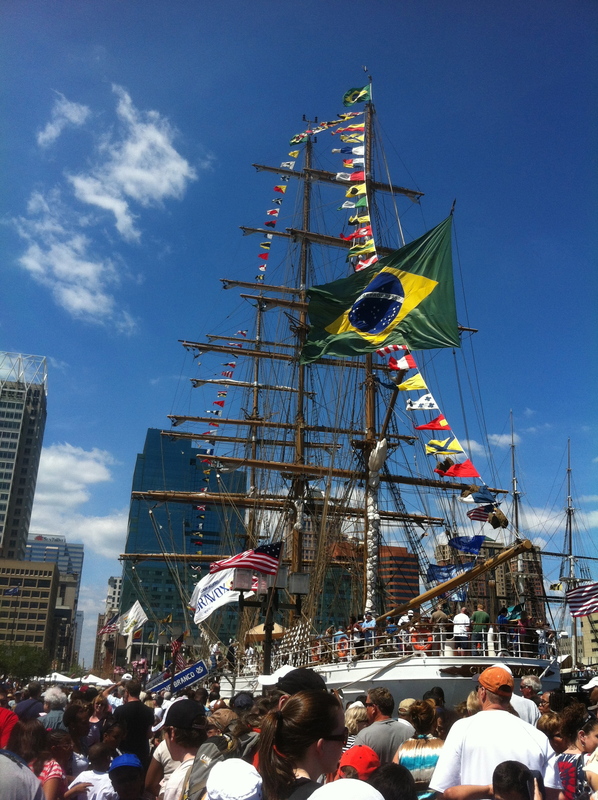 And there was a concert and the Sailabration Festival Villages at Rash Field and Broadway Pier opened their stalls. Friday boasted another beautiful day for touring the ships and enjoying the festivities. Martin State Airport allowed visitors to get up close and personal with their military aircraft on Saturday and Sunday. Adventurous souls could even take a ride in the Navy Flight Simulator! Four of the Blue Angels perform one of many jaw dropping maneuvers. In the waters in front of Fort McHenry the Navy demonstrated its latest Special Warfare Combat Craft on Saturday & Sunday, while overhead the Blue Angels performed superhuman aviation tricks. The Saturday night capped off with a concert and Fireworks at Fort McHenry. Rigging of the B.E. 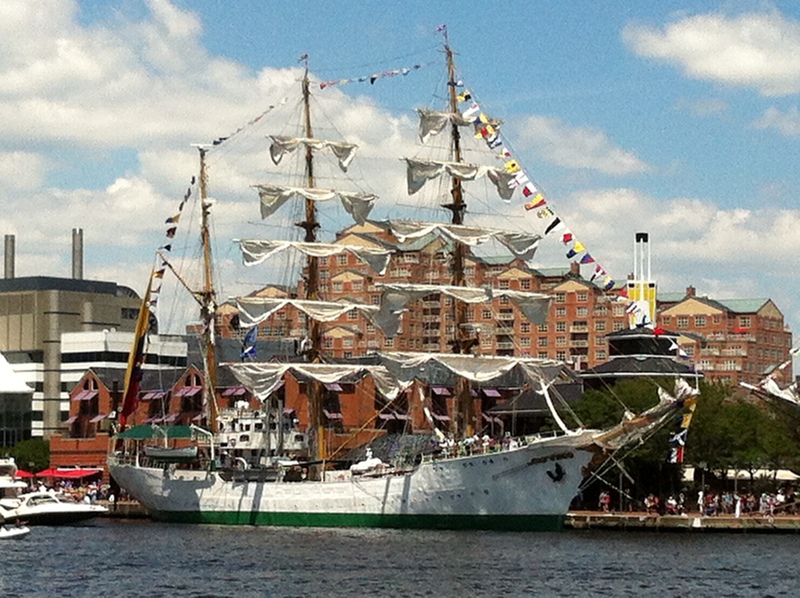 Cuauhtemoc, a Mexican tall ship. 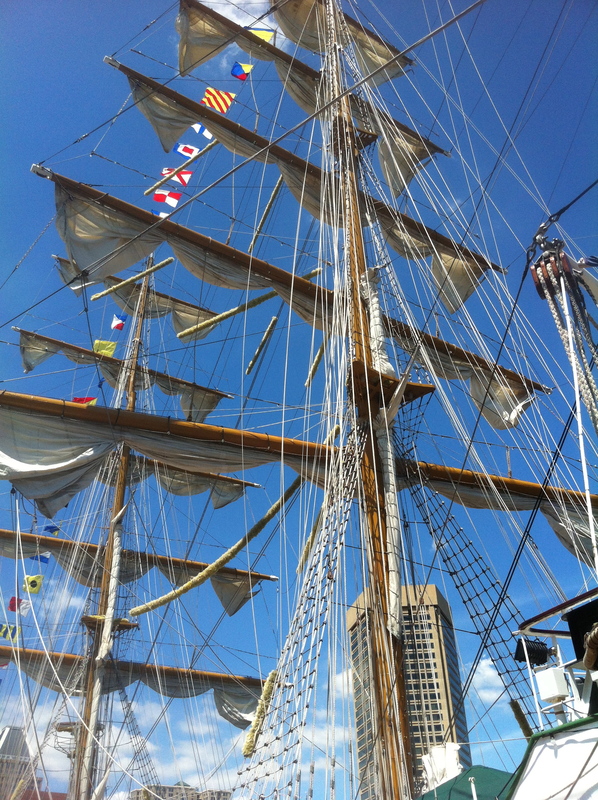 Today, Sunday, will bring much of the same beautiful weather, ship tours, (crowds) and Blue Angels. Tonight you can catch a Star-Spangled Symphony at the Meyerhoff Symphony Hall. The musical event includes the premiere of Philip Glass’ “Overture for 2012”. On Monday representatives from the US, Great Britain and Canada will commemorate the anniversary of the Declaration of War on Great Britain with “From Enemies to Allies” at Fort McHenry at 10:30. Ship tours continue. 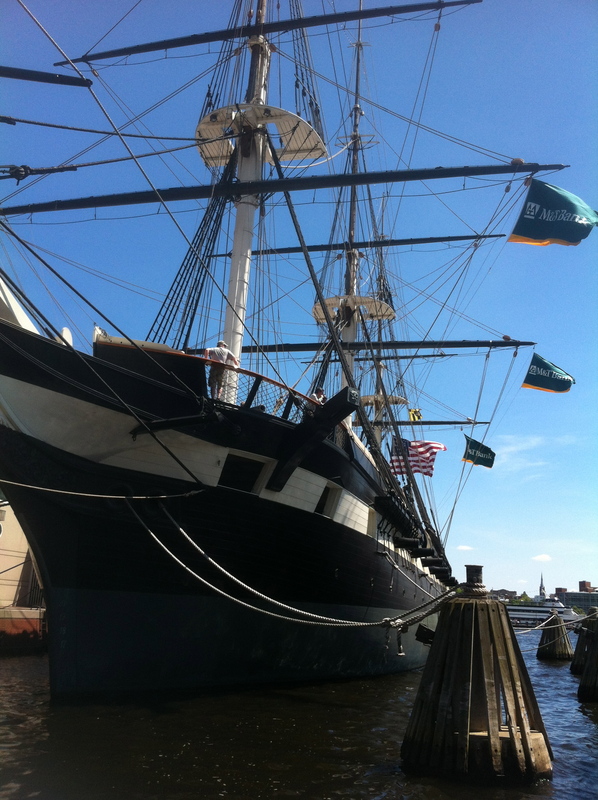 The USS Constellation, a Sloop-of-War ship launched in 1854. 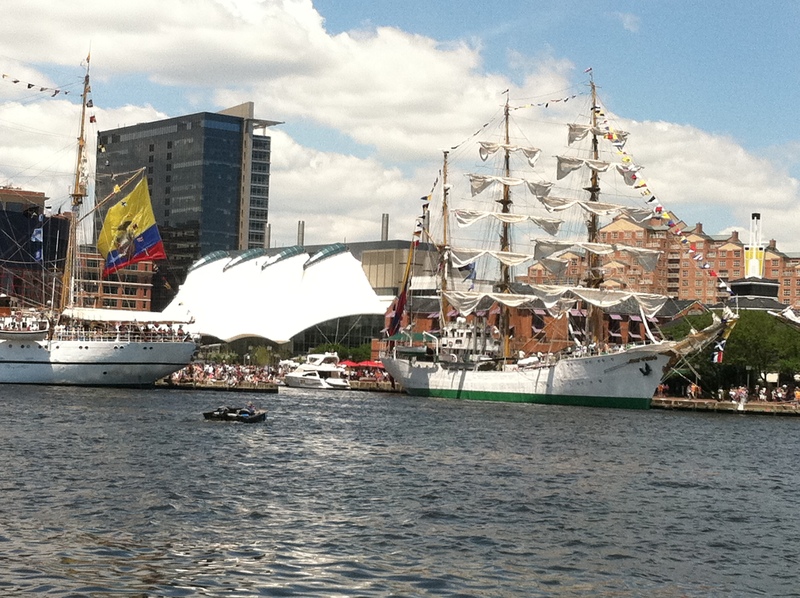 The Sailabration ends on Tuesday as the ships leave the Baltimore area. 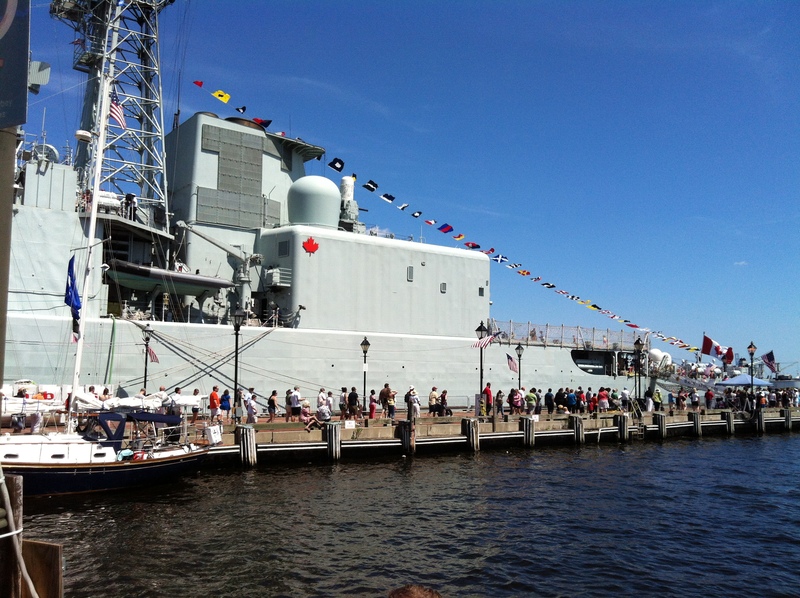 Warships, like the Canadian Iroquois docked at Fells Point, debark from 7:00 to 11:00 am on June 19th. Although The Battle of Baltimore and the Bombardment of Fort McHenry didn’t take place until September of 1814, Baltimore has gotten a wonderful start to celebrating the bicentennial of the War of 1912 with this Sailabration. All content is original. Photos by ritaLOVEStoWRITE and her daughter notesoftheladyupstairs. 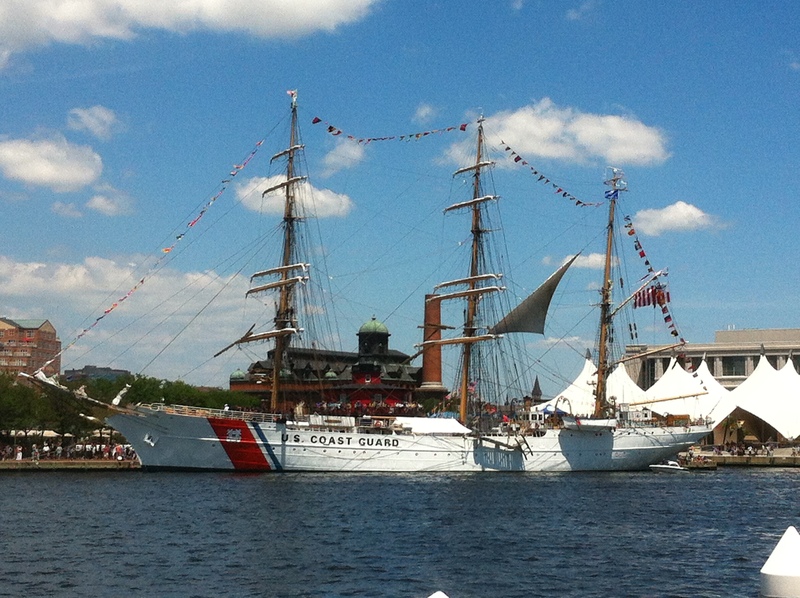 This entry was posted on Sunday, June 17th, 2012 at 6:37 pm	and tagged with Baltimore, War of 1812 and posted in 1812, American History, Baltimore, History, Maryland, Sailabration, Sailling, United States. You can follow any responses to this entry through the RSS 2.0 feed. Great photos! 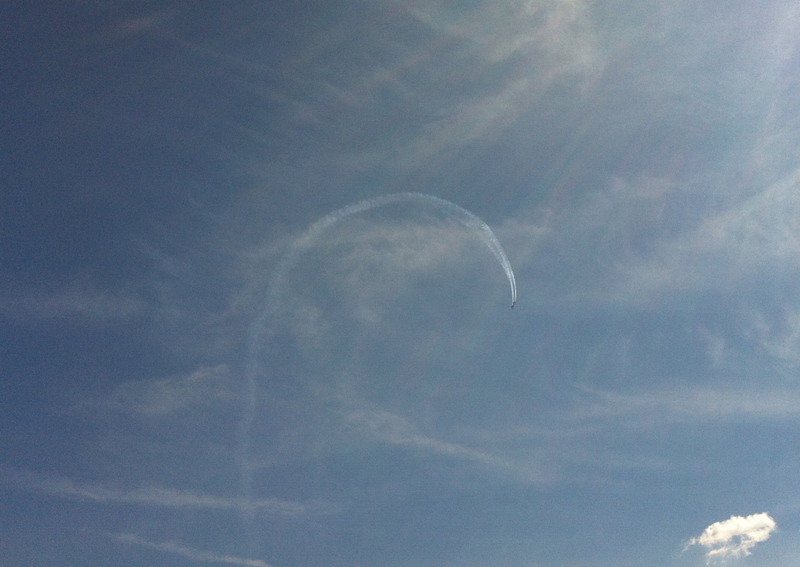 We spent most of yesterday at Martin Airport, watching the Blue Angels get ready for the air show. That was a lot of fun too. They were pretty awesome. I tried to get some video of them, but they were too fast!